The vineyards of this large region (fr. Sud-Ouest) with about 160,000 hectares of vineyards are among the oldest France, From a purely geographical and historical point of view, southwestern France has the entire area between the Massif Central, which forms the eastern border, and the Atlantic coast in the west and, to the south, the Pyrenees at the border Spain, Julius Caesar (100-44 BC) described the conquered Roman province between the river Garonne and the Pyrenees for the first time as Aquitaine (French Guyenne). Emperor Charlemagne (742-814) incorporated it into the Franconian Empire. 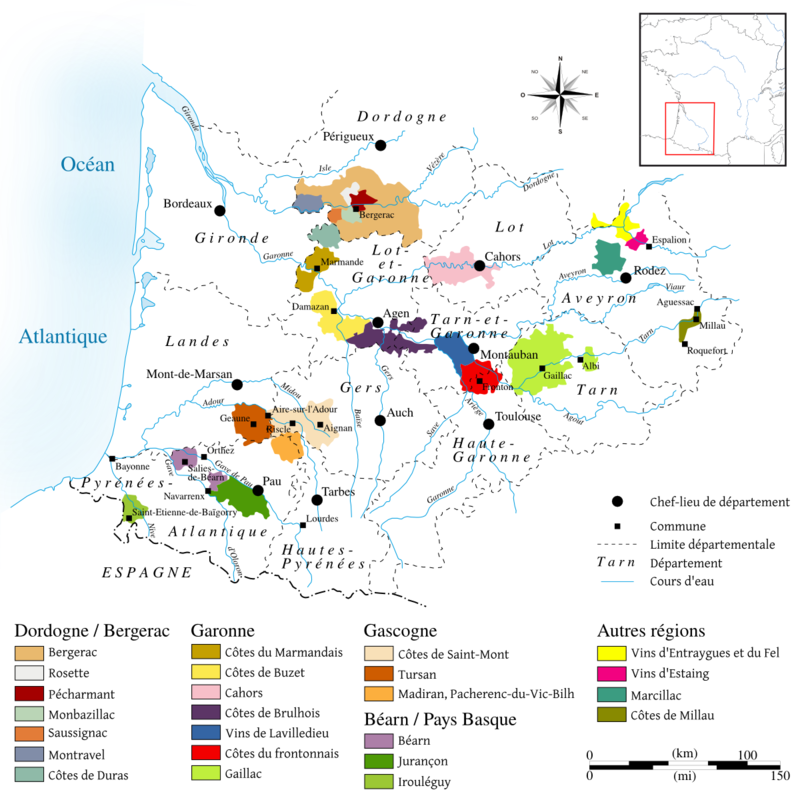 After varied history as an independent county, the gaining of the Gascogne and then under English rule from the middle of the 12th century, the area came only in 1453 finally to France. In the Middle Ages, the Catholic Order cultivated viticulture here, with the monastic orders of the monks of the Cistercian earned. The need of the Dutch from the 17th century for brandy and sweet wines shaped the wine style. At that time the name became Haut-Pays (Upper Land - upstream from Bordeaux) in use. The wines stood for a long time in the shadow of Bordeaux. The wine was sold from the port in Bordeaux and all other areas had to wait until all the wine was shipped from there. Southwest France is also known as the "vine museum" because there are many, some of them ancient ones autochthonous Grape varieties that are increasingly being cultivated again. These are the varieties Arrufiac. Baroque. Duras. Fer. Lauzet. Len de l'El. Mauzac Blanc. Manseng Noir. Négrette and Tannat, These give the wines an independent, typical note. But they are also the classic Bordeaux varieties Cabernet Franc. Cabernet Sauvignon, Merlot, Sauvignon Blanc and Sémillon represented. This page was last modified at 2 May 2018 at 15:00.